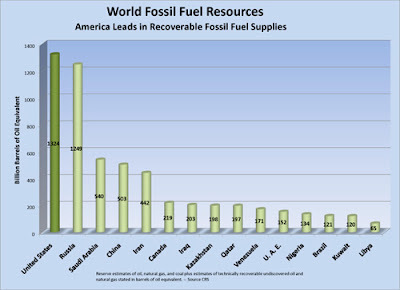 The US has the highest energy reserves in the world. Congressional Research Service did a study of energy reserves: added up our and compared to the world. They give full value to proven reserves and partial value to unproven (undiscovered) reserves. The unproven reserves count because it is in places known to have oil (or coal or natural gas) but are only partially known because they won't be completely explored until they are going to harvested. For example, oil washes up on Southern California beaches from shallow water oil deposits. The oil is there, but is not being used, so it counts as "unproven recoverable." The US has "only 28 billion barrels" of oil (based on the somewhat misleading figure of ‘proven reserves’) according to the CRS in reality it has around 163 billion barrels. As Senator Inhofe’s EPW press release comments, “That’s enough oil to maintain America’s current rates of production and replace imports from the Persian Gulf for more than 50 years”. The US by itself is the OPEC of coal with 28% of the world's reserves. More and more natural gas is being found each year. The US has more total energy reserves than #3 Saudi Arabia, #4 China and #6 Canada combined. Russia is a fairly close second. Uhhh... We have the resources to be energy independent. Not that we would put up walls to the world market. But we can produce much more than we are and buy much less, indeed, choose who we want to buy from. Who would notice Libya without its oil?